Succeed in a major international tournament (quarter finals or above). Find a way of integrating experienced midfielders so they can perform together. Implement a plan A playing formation (4-4-2, although others will be considered). Implement a plan B playing formation (this should include penalties). Work closely with Journalists to ensure brilliant positive PR is achieved. 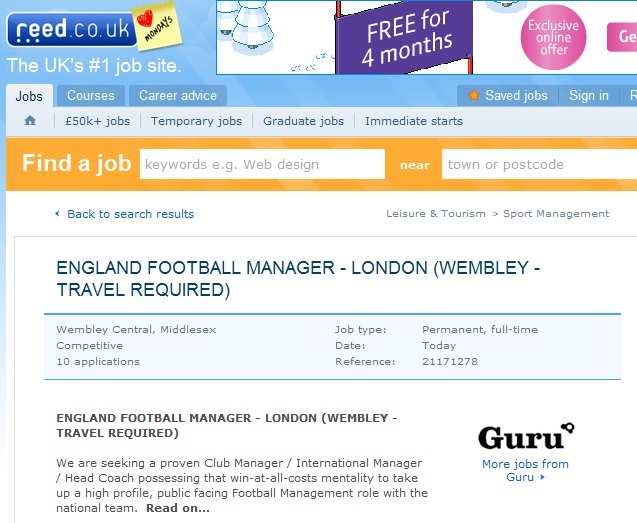 The ad states the employers are particularly interested in hearing from English Club Managers with ‘exemplary tax histories’, currently occupying a top 3 Premier League position. Guess they’re not fans of Redknapp, then. Spotted when Nick Thorpe tweeted it.